Best way to track weightlifting HR and calorie burn? Discussion in 'Apple Watch' started by NazgulRR, May 4, 2015. What would you say is the best approach for tracking HR and calorie burn while weighlifting / strenght training using the built in Workout app on the watch? I was thinking of going with the "other" setting in the app set to "open goal" and then tracking the workout only while doing the sets (i.e., manually pausing the app between the sets during the rest periods). Do you think it was accurate? Just joined, but I would be interested to hear what you guys think is the best way to use this device when weightlifting as well. Pair the watch with a Bluetooth heart rate monitor for more consistent and accurate hr readings. The AW hr monitor is good for the provided workouts but has difficulty staying locked on during weight training. Set the "other" workout to whatever goal you want and go to it. No need to pause between sets cause you're burning calories during activity and rest periods. It's accurate. I've been doing it this way and tracking my hr and calories for a couple years now. I set mine to "other" with an open goal and also use a wahoo tckr HR monitored paired to the AW as I don't 100% trust the AW HR sensors. Set my to other and dont pause between the sets, kinda keeps me from talking to ppl at the gym and when I do supersets its nice to see how quick I recover. After all recovery is part of the workout. I usually burn about 250 in an hour or so depending on what Im doing like leg day burns way more than say chest and back which seems consistent with the previous measurements and estimations I made. ... was thinking of going with the "other" setting in the app set to "open goal" and then tracking the workout only while doing the sets (i.e., manually pausing the app between the sets during the rest periods). I do this every day I weight train. I would not lift weights with a watch on. I would run are do some cardio but lifting weights are doing any other physical activities with a watch on is crazy. It would likely depend on the type of training you're doing. That seems pretty reasonable to me. That's the average, so presumably peak heart rate during sets gets up to ~150, but during rests goes back to 100 or so. I personally just set it on "other" and leave it for the whole session. This is what it looked like for me yesterday. Did 5x5 Squats, 5x5 Bench, 5x5 Row, 3x5 dips, 3x8 curls. My guess is it's overestimating calories burned by 50% or so, but I'm not too worried about it. The other thing I did for lifting was flip the watch so the crown is away from my wrist. With the crown toward my wrist, the elastic collar on my lifting gloves would constantly press the crown in during reps. The Watch is designed and optimized to be worn during all awaken hours. If you are not wearing it you are missing calories, standing, movement and.... It is "crazy' not wear it. If you don't mind, can you provide your age and weight? Also, are you a man or woman? There's a formula that can estimate calories burned if you have the following data. My Fitbit Charge HR generally calculates that I burn about 250 calories during a 40 minute weight lifting sessions (which includes a 7-10 minute treadmill warmup). Avg BPM 130. Thanks for all the responses guys! I let the app run constantly today during my workout, without pausing in between breaks. The "other" setting apparently logs the activity as a brisk walk if the watch cannot get a good HR reading. Any way on how to find out if/when it does that? Where's the duration in that formula? Male, 86bpm, 40min, 25 yo, 65.1kg. 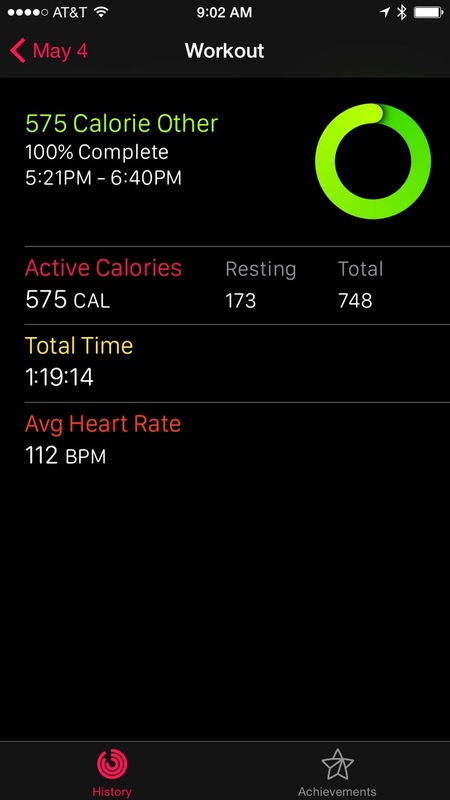 Apple Watch estimated 56 resting calories and 156 active calories for a total of 212 calories burned. have you ever used lifting straps? i stopped the whole glove thing in the first year of working out and switch to those and never looked back. I don't have the watch yet wondering how it will work with these. And why is that according to you? what about if you play basketball? I don't know about you guys but when I lift weights I don't like anything on my wrist. If you play basketball, you run the risk of running into people or being knocked down (I had a scar on my elbow that took a couple years to disappear from being knocked over during a basketball game). Lots of people already wear sports watches and this is true of weight lifting as well. I have been using it since I got it at the gym with no problems. I've been using mine at the gym for a few days now, and it's not very useful for weight lifting. My Mio Alpha isn't perfect for tracking, but it's much better than the Apple watch. The AW will go for considerable periods where it just says "measuring" and the HR grayed out. It will also on occasion show 60bpm after I just did a bunch of box jumps or dead lifts, which seems... unlikely. Lastly, you're not going to be doing anything with kettle bells in the rack position, as it's even worse if you try to use it on the inside of your wrist (as I can do with my Mio). I have, however, found it to be very good for the exercises that are built in that I've tried: rowing, running, stair climber. Maybe that's why it doesn't show "weight lifting". Just used my Apple Watch for weight lifting circuits. When set to "Other" it wouldn't read my heart rate above ~98bpm when I know I was in the ~150s. Tried setting it to "Indoor Walk" and it then read accurately. Maybe a software bug? no, haven't tried straps. I'm still a beginner so my lifts haven't gotten heavy enough to necessitate straps. I mainly use gloves to keep callousing down. It will also on occasion show 60bpm after I just did a bunch of box jumps or dead lifts, which seems... unlikely.